Looking for a compact, explosion proof pressure transducer? Oil & Gas equipment requires pressure transducers that are reliable and able to withstand extreme environmental and pressure conditions, while providing enough options to fit into any system. 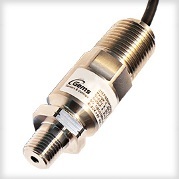 Gems Sensors explosion proof transducers feature all stainless steel wetted parts, a broad selection of electrical and pressure connections and a wide choice of electrical outputs. Gauger420 is now certified for use in explosive atmospheres. The sensor is certified by SIRA of the UK to both ATEX (EU) and IECEx (International) standards. The systems is certified to Ex II 1G Ex ia IIB T4 GA (Ta = -30 to +70 deg. C). Certifications can be viewed here. Gauger420 is a rich featured level sensor for the most demanding applications. The system can operate in aggressive materials and rapidly changing target levels. In addition to 4-20 mA output, the system supports USB and RS485. A large graphic display enhances the performance of Gauger420. Sophisticated firmware adds Open Channel Flow (OCF) and Tank Volume measurement capabilities to Gauger420. 04/13/2014 >> THE FOX MODEL FT3 HAS WON FLOW CONTROL’S 2013 INNOVATION AWARDS!! Fox is proud to announce that the Model FT3 has won Flow Control's 2013 Innovation Award due to its innovative and state-of-the-art design! "The FT3 Flowmeter is more accurate than others we had used before, and the Cal-V function means we do not need to send the flowmeter back to the factory or testing agencies every cycle." LU-R2100 blue (LU-R3000 color) LCD recorders may be 1 to 16 channels input, have outputs of status control, alarm, sensors power supply etc.